In this short discussion  that we have before us, we will take it as a reminder and an encouragement for our sisters with regard to holding on to the Truth, the Sunnah, and the way of the Salafus-Saalih (the earlier righteous generations) – and to beware of straying away from that . We find year after year, and nearly two and a half decades, rather close to three decades have passed since Da’watus-Salafiyyah came to be known in this land, the United Kingdom. Throughout the years, even with all the efforts in the da’wah over these years, we’ve seen how some of our sisters (and brothers) approach Salafiyyah. Many of our sisters, when they are in company of women who are upon the truth and upon Salafiyyah, then they manifest the truth and they remain upon Salafiyyah, due to their association, alhamdulillaah – and that, no doubt, is from the fruits of good friendship. Similarly, if they marry a man who is a Salafi, upon the way of the people of Sunnah, upon the way of the Sahaabah (رضي الله عنهم), then for so long as they are married to him, they will remain with him upon the truth. But if they depart from him, for whatever reason, they abandon the truth and follow the religion of the man they marry after him. And if they remain with the man who is upon the Sunnah, and then he goes astray, they go astray with him. So if he’s Tablighi, the wife is Tablighi, if he’s Hanafi Maatureedee, the wife becomes a blind-following Hanafi Maatureedee, if he turns to Ikhwaanul-Muslimeen then the wife too becomes an Ikhwani. This is not the methodology of Allah’s Messenger ﷺ – and it shows a severe weakness in one’s understanding of the Religion, and a weakness in Imaan. The Methodology of Allah’s Messenger and that of the Messengers and the Prophets that came before him is that they would hold on to the truth regardless. Look at Aasiya (رضي الله عنها), the wife of Fir’awn (Pharaoh). She accepted the da’wah from Moosaa (عليه السلام) and entered into Islam whole-heartedly, worshipped Allah as she was commanded – and that was regardless of the fact that her husband was the most tyrannical, despicable, and arrogant man walking the earth. Regardless of all that, she held firmly to the truth. Even when he tortured her, caused her pain, threatened her with death, and eventually killed her in the most terrible way. She remained firm upon the truth until her last breath. He laid her out in the open sun, and iron nails were driven into her shoulders, her arms and legs. Fir’awun left her out in the heat of the baking sun bleeding to death. At that time all she said was, “My Lord! Build for me a home with You in paradise and save me from Fir’awn and his work, and save me from these wrongdoing people.” [Surah Tahrim: 11] Then the angels came to her and shaded her with their wings, Allah then opened up the heavens, so she could see the house that was built for her in Jannah. Allah has promised all that for those that follow the straight path and are steadfast upon it – that path that Allah has bestowed upon the righteous and the pious. Allah has blessed them to follow that path, like the wife of Fir’awn, who went through all of that torture and yet she did not give up. This is true Istiqaamah (Steadfastness). Allah has not tried us with what He tried her with, yet some of the womenfolk fall short with the trials that are minuscule compared to what she went through. So, where is your steadfastness? Where is the fulfilment of this Aayah in your life? Upon whom do the angels descend at the time of death? Those that say: “Our Lord is Allah” – like the wife of Fir’awn! She knew that her Lord is Allah, and she worshipped Him alone, even though her husband was saying: “I am your Lord, most high”[Suran Naziat: 24]. She refused him because she knew that Allah is the One we worship, the One we obey, submit to, prostrate to, and whose rights should not be transgressed against. Allah has shown you, my sisters, that if you have istiqaamah and believe in Allah, worship Him and obey Him, you have nothing to fear. Allah will give you the glad tidings and those angels will come to you in that time of grief and fear. Why? Because you were righteous my sisters, because you followed the Sunnah – and you did not follow the desires, whims, immoral cultural habits and false practices of the people. You were not deceived by the life of this world and its glitter. So Allah gives you the glad tidings at the time you need comfort more than you have ever needed it before! At that time when you need your Lord. At the time when you know none can protect you except Allah. So, Allah sends to you those angels. Imagine receiving those words at the time of death. At that time, what would that do to the heart of the believer? And not only that, but the angels say “Receive the glad tidings of Jannah.” At that time when you are lonely and your family cannot help you. Your wealth cannot help you. At that time of near despair, fear and sadness, the angels say, “Do not fear, and don’t be sad. Receive the glad tidings of Jannah.” The Jannah that you have been promised. Why? Because you were righteous. You were not involved in shirk. You did not care about anything except worship and obedience to Allah and fulfilling the duties He had made incumbent upon you. You followed the Sunnah of the Prophet ﷺ and fled from sins, disobedience and from bid’ah and the false practices of the Sufis, the Khawaarij, the insurgents, the terrorists and the Raafidah – all of this from the blessings of Allah upon you. 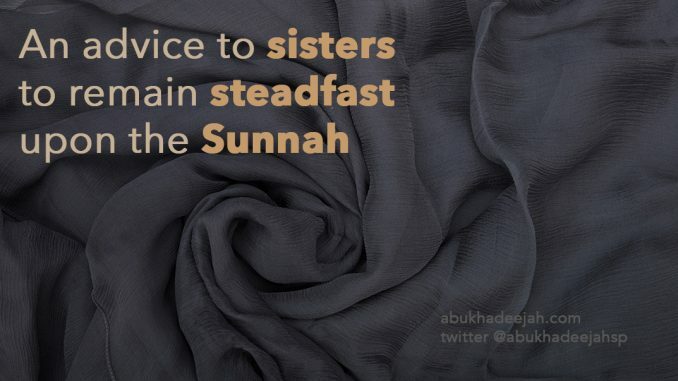 So hold fast to the Sunnah my sisters, just as the Prophet ﷺ said: “Hold on to it (the Sunnah) with your molar teeth.” This is required especially in our times of confusion and doubt. Let us take a lesson from the Sahaabah who, when the mushrikeen (polytheists of Makkah) used to harm them, punish them, torture them, starve them, and boycott them remained patient. Look at what they did to Sumayyah ( رضي الله عنها ). The polytheists of Makkah put her out in the open desert. This occurred a thousand years or more after the time of Fir’awn – and you recall what he did to his wife Aasiyah. So these idolators tortured Sumayyah, and she became the first martyr in Islam. They took her out into the open desert because she was a poor woman, who had no tribe to protect her, no one to protect her except for her immediate family, who were weak. So, they took her out and beat her and made her burn in the heat of the Sun – but still she would not leave her religion, she would not give in to what they ordered her to do. They became frustrated and enraged with her and heated up a spear then, forced it into her abdomen, up until she died. This is Istiqamaah! This is steadfastness upon the Religion! Alhamdulillah, that Allah has not put you through those trials. Imagine the Day of Judgement, when mankind will be naked and uncircumcised. On that day of terror and heat. On that day when no one can help you except Allah, the Mighty and Majestic. You will then see a drinking lake and you will rush towards it because you are thirsty. In that suffering state you see the Prophet standing by that lake, and you see drinking vessels made out of gold and silver, as numerous as the stars in the sky. You race towards that just like everybody else from this Ummah, but then you see people being pushed away – Subhaanallaah! People who are in terror, people who don’t know what’s happening. Like moths scattered and then you see that the angels are driving them away. The Messenger of Allah calls out, “My Ummah! My Ummah!” The angels then inform him ﷺ: “You do not know, O Muhammad, what innovations and heresies they innovated after you!” And now you look towards yourself, my sister, and ask yourself: “Am I involved in innovation? In heresy? In sectarian practices? Am I amongst them? Was I with the people of Sunnah? Am I close to Muhammad? Will he intercede for me?” On the Day of Judgement, as the people are being pushed away, you are allowed to go through, then you are in front of Muhammad ﷺ. Why? Because you adhered to his Sunnah. Then you lower your head and drink from that lake and that vessel. You drink from that water that is pure, sweeter than honey, whiter than milk, and you never become thirsty again. You feel comfort because you were allowed through while many others were turned away because of their innovations. Imaam Al-Qurtubee (rahimahullaah) mentions that those that will be turned away from the lake on that day are the Khawarij, the Mu’tazilah, the Raafidah, the people of bid’ah. So now you understand why it is important to hold on tenaciously to the truth with your molar teeth as the Prophet ﷺ said: “Whosoever from amongst you lives for long will see a much differing and controversy – so upon you is my Sunnah and the Sunnah of the Rightly Guided Successors after me, and hold on to it with molar teeth.” Look at the choice of words by the Prophet ﷺ about whom Allah said: “He does not speak of his own desire. It is only revelation that is inspired.” [Surah an-Najm: 3-4]. The teeth at the back of your mouth – when you hold on to something with them, you don’t let go easily. Hold on to the Sunnah with dear life my sisters because at the time of death, and on the Day of Judgement it will benefit you. It will grant you entry to Jannah. Keep clear from the way of the Sufis, the grave-worshippers, Jamaa’at ut-Tableegh, Ikhwaanul-Muslimeen, Hizbut-Tahreer, GLM, Ihyaa Turaath, Jamaa’atut-Takfeer or any of those parties of politics, bid’ah and misguidance. Rather hold fast the way of Muhammad ﷺ. Then at the point of death you’ll be glad you were upon Sunnah and Salafiyyah. This is our way sisters, this is the way of Imam Abu Haneefah, Imam Shaafi’ee, Imam Maalik and Imam Ahmad Ibn Hanbal. Abu Haneefah (d. 150H) said: “When a hadith is found to be saheeh, that is my madhhab.” Ibn Abdil-Barr and Ibn Al-Qayyim cited a narration that is authentic upon Abu Haneefah: “It is not permitted for anyone to accept our view if they do not know where we got it from.” This was the way of Abu Haneefah who died in the year 150 AH. Likewise Imam Maalik Ibn Anas who died in the year 179H said: “Truly, I am a human being just like you, I make mistakes sometimes and I am correct sometimes. Therefore look into my opinions, all that agrees with the Book and the Sunnah, accept it and that which does not agree with the Book and the Sunnah then leave it.” Ibn Abdil-Barr cited this from him in Jaami’ Bayaan al-‘Ilm. Imam Ash-Shaafi’ee said: “The Sunnah of Allah’s Messenger reaches us and some of it escapes us, so whenever I voice my opinion or I formulate a principle which is in contrary to the Sunnah of Allah’s messenger then the correct view is the Sunnah. And if that is what the Messenger is upon then, that is my view also.” This was the way of the Salaf of this Ummah. 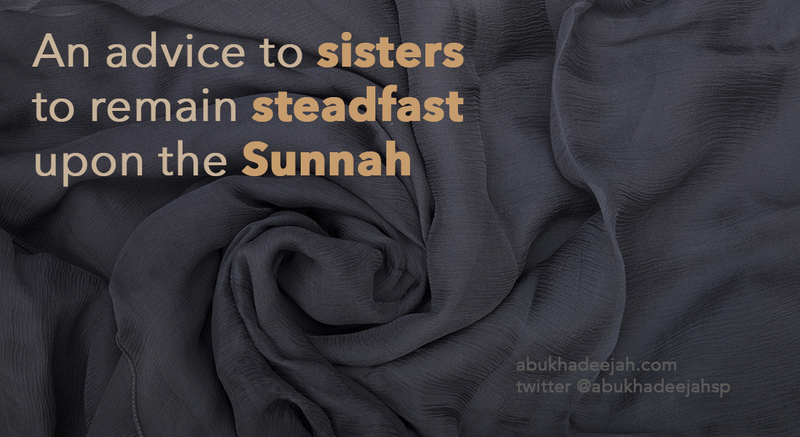 One does not sway when it comes to the Sunnah! Do not be Salafi merely by association – even though, we say, there is some truth to that: that we keep companionship with the Salafis and the people of Sunnah. These are the people we befriend, because the Prophet ﷺ said: “A man is upon the religion of his close friend, so look to whom you take as a companion.” Who is it that you have taken as your companion, my sister? So when you marry, you should marry a man of Sunnah and Salafiyyah. It is haraam to marry an innovator. Is that too bold? No, rather that is the Sunnah of Allah’s Messenger. We get this from the Prophet’s saying: “The curse of Allah, the angels and all the people is upon the innovator and upon the one who accommodates him.” (Hadeeth in Al-Bukharee) The curse of Allah is upon the one who protects the innovator and gives him a platform to spread his misguidance. Will you marry a despised man? And then, some sisters say, “No problem I’ll get him to the masjid once I marry him.” The Prophet ﷺ said: “A woman is married for four reasons: Her wealth, her lineage, her beauty and her religion. Marry the one with the religion and you shall be successful.” Which religion does the innovator have? What religion does the innovator have except a religion based upon desires, whims, dreams and misguidance. The Prophet did not say marry the innovator and then bring him to the Sunnah, but said marry the one with the religion and you shall be successful. So the Sahaabah used to to seek righteous women for marriage. And the female Companions, the Sahaabiyaat, would marry righteous men. They would go to the Messenger of Allah and seek his advice, because they wanted advice from him as to who is the most righteous of the Sahaabah, even though all the Sahaabah were righteous but the women wanted the best of them. My sisters, in our time, we have no Sahaabah of course – but we have people that try to emulate them. Why do you then have to scrape the bottom of the barrel in choosing a life-partner when you can reach the best of ahlus-Sunnah for your daughters, sisters, and for yourselves? Look at the statement of Ahmed Ibn Hanbal: “Do not blindly follow me, neither Shaafi’ee, nor Ath-Thawree, nor Al-Awzaee but instead take from where they took.” This is what puts the love into our hearts for those scholars, because they were not in it for the status, love of notoriety or fame. They called to the Deen of Allah, sincerely. Alhamdulillah, Allah has still preserved scholars for us in this era, like Shaykh Al-Fawzaan, Al-Luhaydaan, Rabee’ Ibn Haadee, ‘Ubaid Al-Jaabiree, Muhammad Ibn Hadee, etc. In our eyes these scholars are considered as the Jamaa’ah. It is reported that when a group of people came and asked Abdullah Ibn Mubaarak (died in 181H): “Who are the Jamaa’ah?” This is within a one hundred years of the death of the Prophet Muhammad ﷺ. So he answered: “Abu Bakr and Umar.” So the people said: “But Abu Bakr and Umar have died.” So he said: “Then it is so-and-so.” They said: “They too have died.” The people wanted to know the people of truth that are alive. He said, “In that case, the Jamaa’ah is Abu Hamza As-Sukkaree al-Khurasaanee.” He mentioned one of the great scholars from Khurasaan. So, it is incumbent upon you my sisters to cling to the people of truth because of the truth that they are upon (i.e. the scholars). Know them and acquaint yourselves and your children with them. Hold on to the truth just as Ahmad Ibn Hanbal said: “The foundation of Sunnah with us is to hold fast to that which the Companions of Allaah’s Messenger were upon and to follow them and take them as a model and example to be emulated.” These are the people of Sunnah, but the people of Sunnah in our times are small, so you my sisters, are bound and obligated to stick to the truth in this time. Imam Sufyaan Ath-Thawree (died 161 AH) said: “If you reach a man in the east, who is a person of Sunnah, and another one in the west, then convey our salaam to them and make dua for them for indeed the people of Sunnah are few.” That was in that time! My sisters, do not tolerate people speaking ill of our scholars in your company. Do you not fear that Allah’s punishment will reach you? That the people of the truth are being spoken ill of and you remain silent? Do not allow people to speak about the Salafis of this land. The Salafis do not allow the people of truth to be insulted, reviled or abused. Do not sit with those that speak ill of the people of Sunnah because they are the people of bid’ah, those who attack ahlus-Sunnah. Where will you be on the Day of Judgement, when the angels will drive the people away from the Drinking Lake (Al-Hawd) of the Messenger of Allah, and you are hoping with dear life that you are not from those driven away? Then you think to yourself, “The People of Sunnah and their Scholars were being cursed and reviled and I did not speak up. The Salafis were being abused and I did not speak up. I sat and listened to the innovators and deviants – rather I was agreeing with them and defending them! When ahlus-Sunnah were being reviled I allowed them to be reviled. I did not adhere to the Sunnah as I should have.” Put yourselves in that situation, in your dark and cold grave. Who is going to help you now? Did those angels give you the glad tidings of Jannah? This is where misguidance takes you. You have Salafi Mosques and Maraakiz around the country, whereas twenty years ago we had nothing like that in this country. All we had were those Ikhwaanee types claiming to be Ahlul-Hadeeth. Maybe there were handfuls of Salafis in the major cities – they were Ghurabaa, Strangers. Then, Allah blessed them: from the efforts of a group of individuals – May Allah count us from them. After twenty years we have a Salafi Masjid/Markaz in almost every major city however small or poorly funded it may be. We have thousands of Salafis up and down the country now. So, where are you? With them or against them? Or are you like the rabble that answer the call of every deviant that screams out to them? Do not make your religion like that of the ignorant rabble. Be settled with the people of truth, O sister. Alhamdulillah, Allah has blessed this da’wah, so why would you want to die upon other than it? How will answer your Lord? Will you stand of the Day of Resurrection with Ibn Taymiyyah, Ahmad Ibn Hanbal, Sufyan Ath-Thawree, Ash-Shaafi’ee, Ibn al-Musayyib, Maalik Ibn Anas, and so on, who are the virtuous and truthful ones in this world, and likewise in the next, inshaa’Allaah – or are you going to stand with the innovators in this life and the next? The likes of Jahm ibn Safwan, Sayyid Qutb, Usaamah Ibn Laden, Muhammad Ilyas Al-Kandahlawee, etc. Where will you stand ? With these enemies of the Sunnah? Or with Abu Bakr, Aa’ishah, Aasiyah, ‘Umar, Uthmaan, Khadeejah, Faatimah, etc. You think this is an affair merely of the Dunyaa? You think it’s “brothers against brothers, masjid against masjid, sect against sect” for the sake of this world? This is a battle, my sisters, between truth and falsehood. The Belief and Methodology of the Salaf is the criterion between truth and falsehood – and it is upon this basis you’ll be judged on the Day of Resurrection. So hold on to the truth with dear life and don’t flinch. Don’t be cowered by the large opposition. Ahlus-Sunnah are strong because they strive to make their knowledge and Imaan strong, because they following the Quran and Sunnah, and the way of the Sahaabah – and they remain steadfast upon that until they meet their Lord. We ask Allaah to make us believers upon the Path of the Salaf, sincere, truthful and humble – and that He unites us with the true believers in the Hereafter. And all praise is for Allaah, and may the peace and blessings of Allaah be upon the Messenger, his family and his true followers. Lecture transcribed and summarised by Bint Rasheed (may Allah reward her). Beautiful article, may Allah reward you. Need it…alhamdulillah. Excellent advice…heart warming.encouraging.